The Argentine newspaper Clarín revealed Friday that investigators had found a bizarre drug cocktail of the tranquilizers clonazepam and ketamine in the blood of Alberto Nisman, a top prosecutor found shot dead the night before testifying to Iranian meddling in Argentina’s government. Nisman was found dead of a gunshot wound to the head on January 18, 2015, in his apartment, the night before he was to testify to Congress that his research suggested that then-president Cristina Fernández de Kirchner agreed to help the Iranian authors of the 1994 bombing of the Argentine-Israeli Mutual Association (AMIA) evade justice in exchange for favorable oil prices from that country. The AMIA bombing was the deadliest terrorist attack in the Western Hemisphere before September 11, 2001, killing 85 people. Kirchner’s legal team initially ruled the death a suicide. President Mauricio Macri launched a new investigation, using a new legal team, following his succession of Kirchner that has found evidence Nisman’s death was a homicide. Clarín reported last week that the new toxicology findings suggest that Nisman had either tried to use a nearly unprecedented mix of drugs—clonazepam is a tranquilizer typically prescribed to help with anxiety, while ketamine is a veterinary anesthetic sometimes illicitly used by humans for recreation—recreationally and killed himself, or someone drugged Nisman in order to kill him without a struggle. While initial toxicology tests had found the clonazepam, commonly prescribed enough to not raise suspicions, the discovery of ketamine creates many new legal questions. Police did not find any evidence of a struggle in Nisman’s apartment following his death. Clarín notes one other unexplained mystery in the Nisman death: Someone used his computer at 7 a.m. local time on January 19, an estimated four hours after forensics tests suggest he had died. Nisman had spent years studying the AMIA bombing since appointed as head of an investigative committee into the incident by former Argentine president Néstor Kirchner, late husband of Fernández de Kirchner. His studies had unveiled clear direct links between the AMIA bombing and the Iranian government and led to Interpol issuing “red notices” for the arrests of six Iranian nationals in relation to the terrorist attack. Before his death, Nisman had found that the Fernández de Kirchner government had attempted to annul the red alerts for trade benefits from Iran. He had drafted arrest warrants for the president and her chief diplomat before his death, which investigators found amid trash in his apartment. Shortly after his death, Kirchner chief of staff Anibal Fernández told reporters that Nisman led a “licentious lifestyle” and accused him of vacationing in Cancun with a “known prostitute.” “His salary could not have covered all that,” Fernández claimed, suggesting he committed suicide due to personal debts. The investigation into his death has not unveiled any corroborating evidence for the debt accusation. 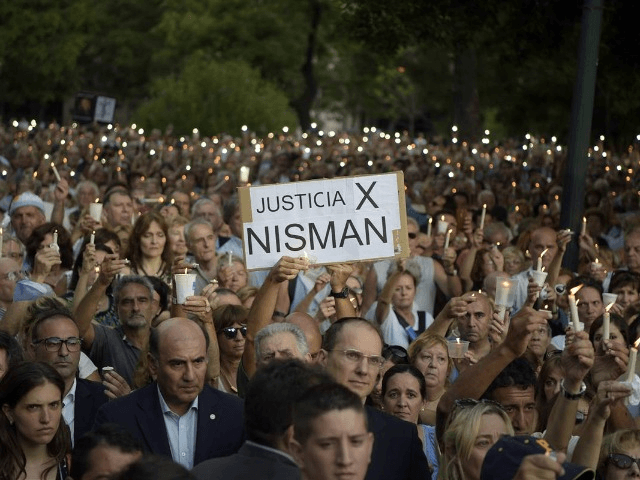 Nisman’s death triggered protests rallying hundreds of thousands of Argentines calling for justice, many holding signs blaming “Islamic fundamentalism” for Nisman’s death. Following Macri’s election, a new team took on the investigation and began uncovering evidence that Nisman could not have killed himself. Macri had said as a candidate that he did not believe Nisman had committed suicide and vowed to uncover the truth if elected president. In February 2016, district attorney Ricardo Saenz demanded Nisman’s death be investigated as a murder. Iran has denied any involvement in Nisman’s death or the AMIA bombing.